Women who competed in thirteen sports at the UO between the time of the Second World War and the early days of the Reagan administration gathered in Matthew Knight Arena for an event thanking them for their pioneering spirit, their sacrifices, and their "love of the games" they played without the acknowledgments that women receive today. Attended by more than 600, the Women in Athletics Celebration honored 250 former Oregon women athletes and coaches whose efforts took place before the UO granted letters in women's sports. Alexandra Notman, MA '11, wrote the following story, "Letters from the Past," about three of the honored athletes—all current UO student affairs staff members. It appeared, along with the photo by Isaac Viel '10, in the newsletter of the Division of Student Affairs. 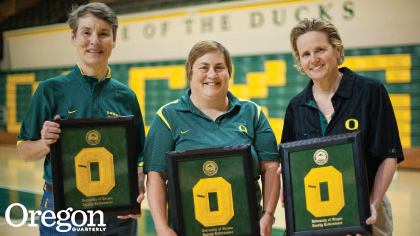 Rees was one of several hundred former female UO athletes from the forties to the eighties who were honored that night with the letters they never received when they were students. Before the 1980s, female athletes at the UO were not granted letters, nor did they receive much financial support. The delayed recognition of female athletes was largely because the U.S. Congress did not pass Title IX until 1972, perhaps the most revolutionary legislation ever passed for collegiate athletes. Title IX stated that equal opportunities must exist for both genders in athletics at any educational institution that receives federal funding. Even with Title IX, the University of Oregon did not start awarding female athletes letters until the 1980s. Polhemus was happy to receive her letter alongside her fellow athletes. “It was an amazing night,” she says. “The athletic department did a great job.” She does hope that the women who could not make the ceremony will still be acknowledged. “Those people deserve their letters no matter where they are. Or a nice letter of recognition,” she says. Wendy Polhemus played basketball, volleyball, and softball her freshman and sophomore years before joining the military. She will retire this December after serving for more than thirty years and earning the rank of colonel. Before attending the UO, Rees was unaware that there was a women’s athletics department. During the first week of classes in 1973, Rees found out about UO women’s athletics by accident. While strolling by Gerlinger Hall on a September day, a woman approached Rees and asked her if she played volleyball. She said yes. “She told me where to show up at 5:00 p.m. to join the teams, and I showed up,” says Rees.